We are a lifestyle store specialising in Scandinavian and European womenswear, menswear, homeware and bath and beauty. Beginning in stylish South London, Bias Peckham opened in 2012 and rapidly grew into a distinctive shopping destination for anyone seeking Scandi inspired, versatile and unique products that you can't find on the high street. 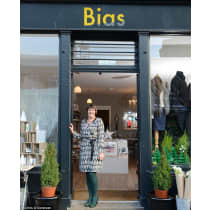 We are delighted to have since opened Bias Harrogate in Autumn 2016 where we are now based. The idea of owning a boutique came about in February 2012 when, after 28 years in teaching, I found myself no longer in education. Six months later, with a business course under my belt, Bias opened on 31 August.